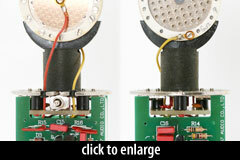 The B-1 is an inexpensive large-diaphragm condenser with a fixed Cardioid polar pattern. A 3-way switch on the front of the microphone enables a 10dB pad or high-pass filter (one or the other, not both). The mic was made by 797 Audio, and appears to be nearly identical to the first-generation Studio Projects C1. The capsule is 797 Audio’s version of the Neumann K67: a 34mm O.D., center-terminated capsule. 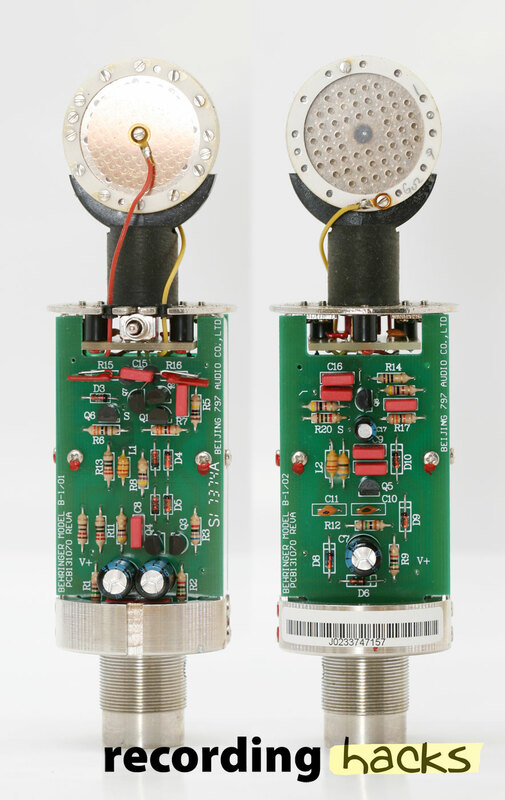 Because the mic is Cardioid only, this capsule was made with single-sided capsule; only the front diaphragm is metallized, and only the front backplate is brass. The B1 circuit, like the Studio Project C1, is a derivative of the Schoeps design, with bipolar transistors used to create balanced output (without a transformer). Notably missing from the B1 circuit is a trimpot to set the JFET bias point. This suggests that the B1 might have higher distortion levels than the Studio Projects C1/C3, although it is possible that the JFETs used in the B1 were biased externally (via selected fixed-value resistor combinations). The B-1 ships with aluminum briefcase, shockmount, and foam pop filter. The Behringer B-1 is also known as: B1/B.